The Nissan Frontier hasn’t changed much in the last years. The last redesign was for the 2005 and a few upgrades came after that. There is no doubt that this model has better alternatives in the market and Chevy Colorado and GMC Sierra are the first associations. 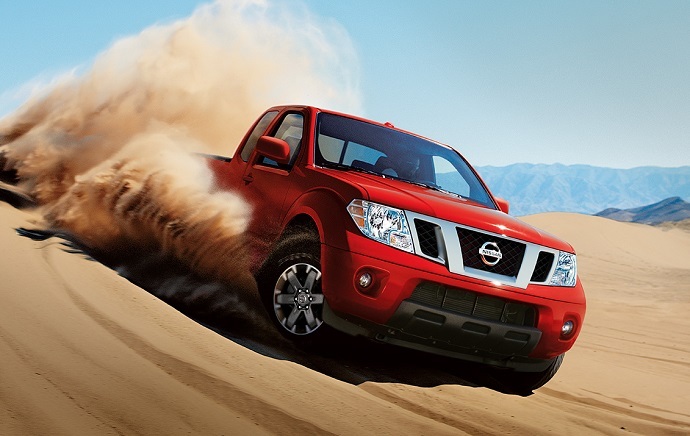 However, the Frontier still features enough practicality and smart design that can get someone’s attention. It includes brawny V-6 engine which is capable to get job done. But if you want to get its best side you should definitely pick its off-road oriented version, 2017 Nissan Frontier PRO-4X. What will you get with 2017 PRO-4X? If you are among truck lovers that like to leave pavement behind and attack dirty roads and trails you can definitely count on the Frontier PRO-4x to suit your needs. It is capable to deliver surprisingly good ride quality and solid off-road capability. With strong V-6 engine and additional off-road hardware we found that this truck definitely has fun-to-drive nature. Providing power for the 2017 Nissan Frontier PRO-4X is a 24 valve 4.0 liter V-6 engine. The engine has lightweight aluminum block and can produce 261 hp. Peak torque is 281 lb-ft. The engine achieves max power at 5, 600 rpm and peak torque at 4, 000 rpm. This trim version comes with two transmissions. For sportier driving experience you should chose a six-speed manual transmission. As option you get a five-speed automatic. For the PRO-4X model a part time all-wheel drive system is standard and it comes with a low range transfer case. If you choose automatic transmission hill start assist and hill descant control are included. PRO-4X models also have electronic locking rear differential. This off-road feature provides equal power for each rear wheel which improves traction and help truck going forward. On the other hand PRO-4X truck has unique suspension with Blistein shocks which feature strong reputation for their quality design. They will soak every bump on the road while speed sensitive power steering will provide optimal steering response at different speeds. The 2017 Nissan Frontier PRO-4X has the same overall design as other version but it comes with some unique features. The model rides on the 16-inch aluminum alloy wheels. Skied plates protect fuel tank, oil pane and transfer case. The model also includes automatic headlights and fog lights. There are also a spray-on bedliner, a sliding bed extender, adjustable cargo tie downs, tailgate spoiler, splash guards, etc. Inside the model includes a 5.8 inch Nissan Connect touchscreen interface with voice controls, navigation, satellite radio, mobile apps compatibility, etc. There is also a 10-speaker Rockford Fosgate sound system. For the comfort of driver and passenger there are supportive seats with PRO 4X seat trim. Front seats are heated and there is also leather-wrapped steering wheel, dual zone automatic climate control, eight-way driver seat, auto dimming rear mirror, etc. The PRO 4X Luxury package is available on crew cab models with automatic transmission. It expands offer with heated mirrors, leather upholstery, roof rack with crossbars, sunroof, and power adjustable front seats. If you like to have off-road ready 2017 Nissan Frontier PRO-4X you should consider starting price of $32, 340.